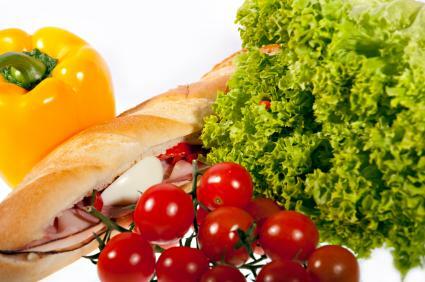 A list of low calorie foods is a necessity for those desiring to reduce their caloric intake and shed weight. If healthy eating is a new endeavor, consider making your own list, which will help to overhaul your old diet. Knowing which foods are less caloric makes it easy to find fast snacks, prepare healthy side dishes and put together light meals while dieting. What healthy foods would I like to eat for breakfast, lunch, dinner and snacks? How can I incorporate foods from every food group to produce a well-rounded diet plan? Where will I be eating most of my meals? After asking yourself the preceding questions you can begin to compile your list based on the answers. If you have chosen oatmeal or cereal for breakfast, look for sugar-free or low sugar varieties. If your ideal lunch is comprised of a tuna salad sandwich, dress it with light mayonnaise on a hearty wheat roll. To incorporate foods from every food group, jot down your favorites in every category. The following food groups represent those that encompass the "Choose My Plate" program created by the United States Department of Agriculture (USDA). Grains: Look for whole grains when purchasing pasta, cereal, rice or crackers. Veggies: Dark greens are among the healthiest . Fruit: When fresh fruits are not accessible, choose canned fruits in natural juice rather than those packed in high-calorie syrups. Dairy: Low fat cheeses and milk products are the best choice for dieters. If you have difficulty digesting dairy, replace traditional dairy products with lactose-free products. Meat or Beans: Good sources of protein include lean meats, poultry products, fish, beans nuts and seeds. Your low calorie food list should consist of foods that fit your lifestyle, dietary needs and specific tastes. If you are a busy career professional with little time to spend in the kitchen, your list should reflect that. Items that are easy to grab on the go or toss into the microwave may be most practical. However, if you have time to devote to meal preparation, consider adding whole foods to your list and those you can combine with other healthy selections to make a hearty home cooked dish. Keeping your lifestyle and dietary preferences in mind, explore the plethora of low calorie foods (Diet Food) and add them to your list. You can create several lists and post them in various places. Hang one on your refrigerator and stash one in your purse or pocket. You can modify your list when you uncover new options at your grocery store or favorite restaurants. Fresh Fruit: A medium size apple is just 60 calories, a large banana is approximately 100 calories. Light yogurt, cottage cheese or low fat cheese sticks. Light or air popped popcorn. Fresh vegetables, particularly starch-free veggies, like celery sticks, broccoli, peppers and cucumbers. Breakfast bars, granola bars and baked chips in 90-100 calorie portions. Pudding made with skim milk. Consider assembling a list of low calorie foods to inspire and encourage healthy eating habits for yourself and your family.